Our WHINT Interface Management Solutions for SAP Middleware (PI/PO/CPI) provide quality & control for your interface landscape, delivering transparency & governance through documentation & reporting and well managed interfaces through monitoring & alerting. IFD: Creates PDF documents per Configuration Scenario listing all routing, mapping details and descriptions. Performance Monitor: This is the basis for the MVR and runs within the PI Monitoring (PIMON) of a PO system. Unfortunately it allows us to analyze and breakdown in smaller periods up to one day. Our MVR is able to retrieve data for a larger period (e.g. MONTH), collect & aggregate the volumes and figures and assign them to reporting areas. Solution Manager (via Early Watch Report) provides runtime statistics also on interface level. 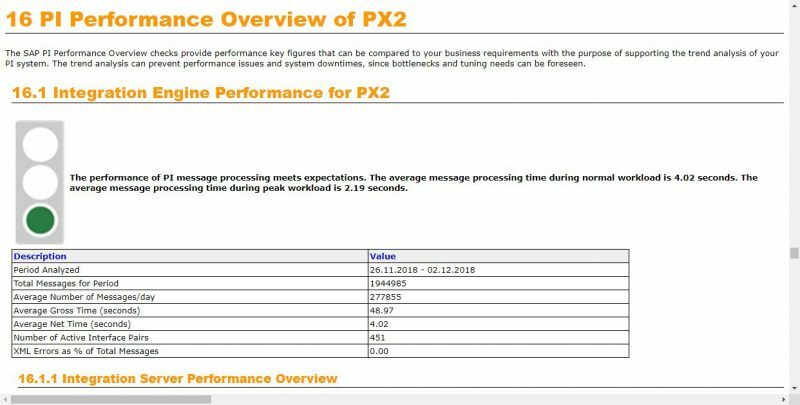 Among many SAP Basis-oriented KPIs (database, memory, sizing, housekeeping) there is also chapter 16 with performance data for all runtime engines. However, you only get the Top 20 interfaces to determine the workload – not to perform optimization by interface. Wily Introscope helps to analyze certain (technical) components, such as channels or queues to identify bottlenecks and optimize/fine tune the throughput. PI Alerting is used for near-realtime alerting in case an error occurs. Sounds great in theory but is a flooding of alerts in reality which creates too much noise. See our article “Why standard SAP PI alerting is not enough”. Solution Manager provides special PI/PO Monitors and can be used for alert management as well. Issue here: Complexity and missing overview with lean message delivery about the landscape status (across components). Application Interface Framework (AIF) is a Local Backend Monitor (ABAP), mainly used for asynchronous inbound messages (XI Proxy, IDoc) which are in error and need reprocessing or manual action. Infrastructure Monitoring Tools such as Splunk provide SAP Basis relevant KPIs and metrics with regards to technical thresholds that can be defined (memory, file system, CPU, etc.). An interface- or process-oriented view is not foreseen. IMS provides periodic snapshots of your interface landscape (channels, messages and queues across runtime systems). Nothing like this exists, however you can achieve coverage by combining several tools. Integration Experts (especially DevOps oriented) go for WHINT Interface Management and Wily Introscope if needed for deep diving into a specific topic.